The approach to Cliff Cottage along the Cleveland Way, looking down into Staithes. Cliff Cottage is on the left. View from Parking area down Church Street. Although the street looks narrow, it is actually wide enough for the bin lorry. This delightful little former fisherman's cottage with private parking next to the cottage and an enclosed garden is an ideal destination for anyone seeking the peace of the North Yorkshire coastline. 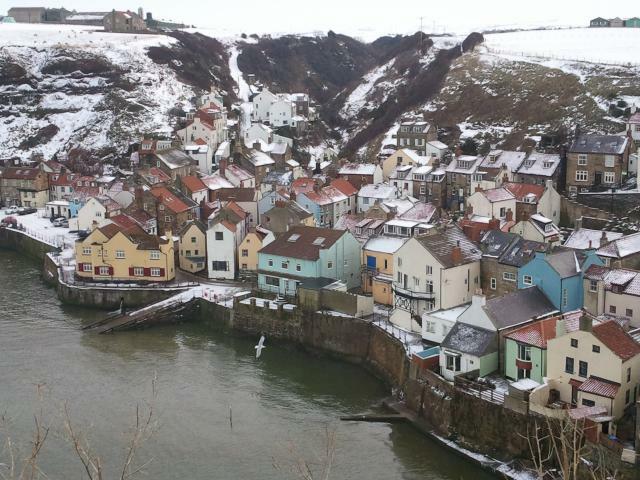 Cliff Cottage is situated in the North York Moors National Park yet only 100 metres from the sea, beach and harbour of Staithes, and in easy reach of Whitby. The cottage sleeps 5 people with accommodation comprising lounge with open fire, small kitchen diner, bathroom, double, twin and single bedrooms. The real asset of this cottage is the pretty, enclosed sunny garden, a real rarity in this village and a lovely peaceful spot to relax. 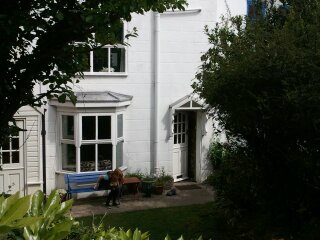 Note that access to a neighbouring cottage and its garden area is through the garden. Private parking is available by the cottage. It is one of the few Staithes cottages with parking.